There is nothing quite like the sound of a big band, swinging into numbers with gay abandon. And the KZN Big Band certainly lived up to their “All Stars” label at the 2018 Hilton Arts Festival. Consisting of keyboards (Melvin Peters at his consummate finest), bass, lead guitar, drums, percussion, four trumpets, four trombones and five saxophonists, the band was tight, together, and obviously enjoyed displaying their craft to an appreciative audience. 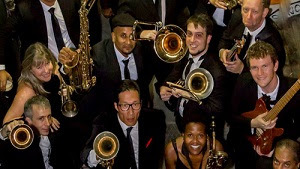 Under the very able direction of band leader Duncan Wooldridge, the band, composed of members of various bands and orchestras within KZN, took us back to the golden era of big band music with numbers like: It Don’t Mean A Thing, Sweet Georgia Brown. Moonlight Serenade, Pennsylvania 65000, A Night in Tunisia, Mercy, Mercy, Mercy, amongst many others. Guest soloist Shelly McLean joined the band for numbers such as All Of Me, Route 66, Cry Me A River and the Stevie Wonder classic I Just Called To Say I Love you, performing admirably, along with a ballroom dance pair who added immeasurably to the show. Two other “guest performers” in the form of 5/6 year old youngsters were brought up from the audience to join in, proving that big band music appeals to all ages!